I have recently been reading quite a bit about 'holocaust' - which refers to the extermination of Jews by Nazis during the 2nd World War. It started with the book 'Schindlers List' on which the famous movie was based. Then I read a book called 'I escaped from Auschwitz' written by Rudolf Vrba who escaped from Auschwitz with his friend Alfred Wetzler and informed allies about the Mass Murder taking place in the concentration camp. The 32 page detailed information which which they dicatated to horrified Jewish Officials in Slovakia came to be known as the Vrba-Wetzler Report. Yesterday I saw the movie 'Defiance' based on a true story starring Daniel Craig. It is about four Jewish brothers who escaped from their Nazi Occupied Village in West Belarus in Poland and joined the soviet partisans to fight the Nazis. The brothers rescue around 1200 Jews from the ghettos in Poland. The movie shows the courage and determination of people who want to live and die like free human beings against all odds.You can find more about 'Defiance' here. Both Daniel Craig and Liev Schreiber have acted superbly. The ego clashes amongst them and their own beliefs in justice seperate them, though they both believe in the same goal of not dying at the hands of Nazis. After watching numerous movies about the holocaust in which people were slaughtered like animals it was a welcome change to see that there were also people who escaped and did fight the Nazis. They were not helpless individuals but rather men and women who took up weapons to save their own lives. Even though the movie has some controversies attached to it. I would give a thumbs up to the director for giving us a different perspective of those difficult times. I would recommend watching this movie and salute the Bielski brothers for their acts of courage. 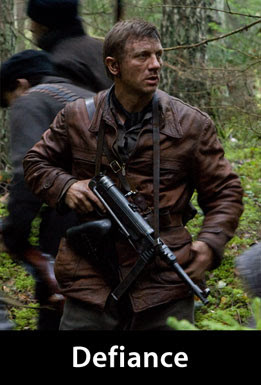 Its not a typical war movie....I am sure you would like it.It really makes us wonder how 1200 people survived the nazis by living in the forests of Poland known for their bitter winters.